This is the drawing I'm working on currently... I think it's just about finished... I just may work on the highlight areas a bit more [especially in the melty head... I'm having trouble with that area]. I'm going a bit crazy with the Mirror Tool in Photoshop lately. This drawing has a bit of everything on it... watercolor, ink, markers, colored pencil and acrylics. I had a snowday today because of the cold. It was -11 when I checked at 5:30am [right after I got the text that school was cancelled.] So... yeah. It's a bit warmer now. No, not warmer, just less cold; it's still freezing. To keep this site from becoming monsters, monsters, all monsters blah blah blah I wanted to share a few more of my drawings. Here are some I did in 2009. Both are self portraits and were done in a variety of media [colored pencils, markers, watercolor]. I really want to start drawing and painting more. Monsters are in the mail again. This time they are headed to Hope Gallery in Bristol, Rhode Island. 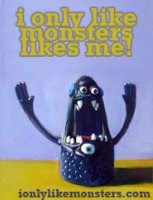 I've never been to Rhode Island so I am letting my monsters check out the state for me. For real though, they're headed to Hope Gallery to be part of the February "Colors of Love" show. If you happen to live around Bristol, Check it out! More information can be found on the Hope Gallery Website if you'd like to purchase one of these critters.